Stanboroughbury draws its design lineage from Hertfordshire’s rich Garden City tradition and, more recently, the 2008 Hertfordshire Guide to Growth. 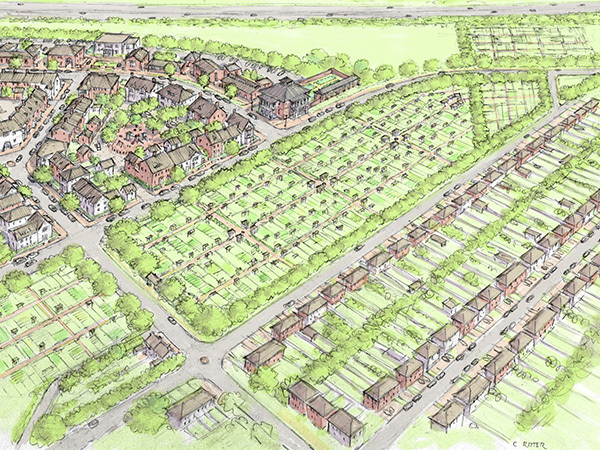 As an urban extension to the existing Hatfield Garden Village, it offers an overarching, sustainable vision for new development which will deliver new housing, community facilities and green space. 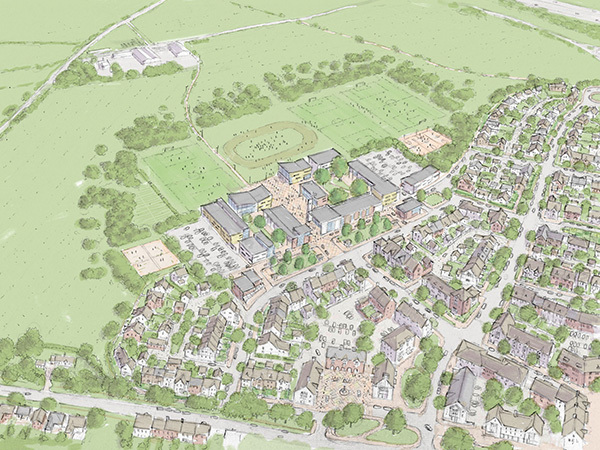 Stanboroughbury is designed as a high quality, mixed-use, pedestrian friendly community that will serve as a model urban extension both locally and nationally. Twenty five per cent of the 1,650 homes will be affordable, through rental and shared ownership. We are investigating ways to make these genuinely affordable for the long term. 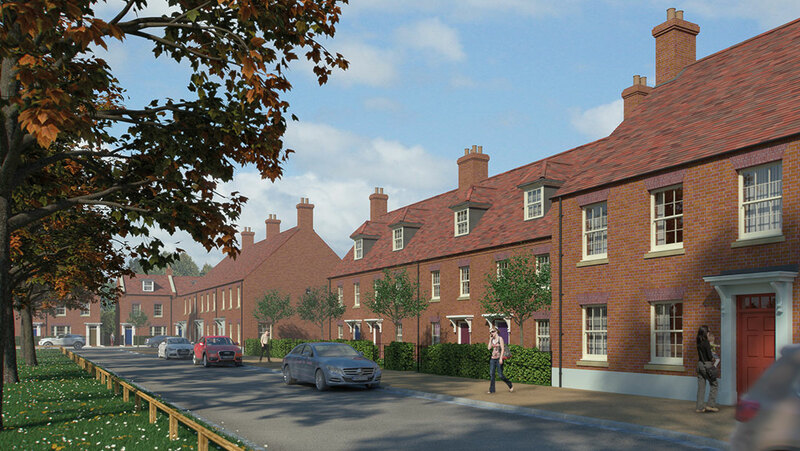 To exist, as the affordable housing does at Poundbury, as a long term asset for the broader community. The Stanboroughbury masterplan offers 41% green space, including parkland, schools and neighbourhood play facilities. This network of green space is designed to integrate seamlessly with the wider green corridor. 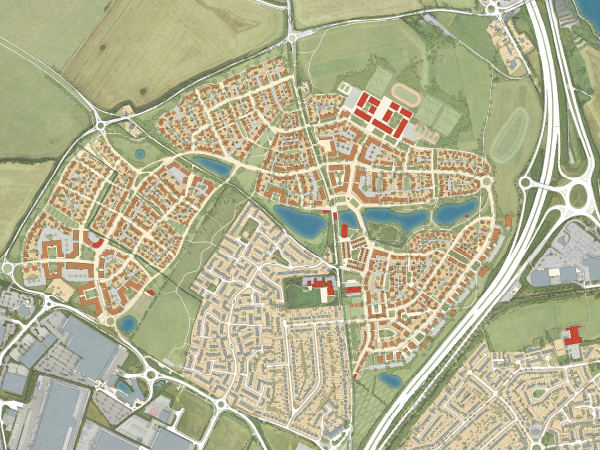 New development can create an improved soft edge to the north western side of Hatfield, safeguarding a stronger long term green belt boundary. The masterplan proposes three walkable neighbourhoods on the 129ha site, each designed to be a five minute walk from centre to edge. Each centre features community facilities, small shops and flexible office space. The Stanboroughbury centrepiece is a network of lakes. These are designed to function as the sustainable urban drainage scheme, whilst enhancing the adjacent parkland and public green space. These lakes create a sense of place at the heart of the settlement whilst separating neighbourhoods and recreational space shared by Stanboroughbury and existing Hatfield Garden Village residents. New housing will be designed and laid out upon agreed masterplanning principles and in accordance with Gascoyne Cecil’s Pattern Book and Building Codes. The key benefit afforded by a larger masterplanned neighbourhood is its ability to fund new infrastructure: buildings capable of community use, primary and secondary schools, roads and attractive pedestrian and cycle paths, for example. This is essential to the establishment of new communities, and mitigates the shortfall in existing provision. Alongside this scope for infrastructure provision, Stanboroughbury enjoys close proximity to both the University of Hertfordshire and Hatfield Business Park which account for nearly 30% of employment with the Borough. In this context it is possible to encourage movement away from private car usage and towards alternative modes of transport.